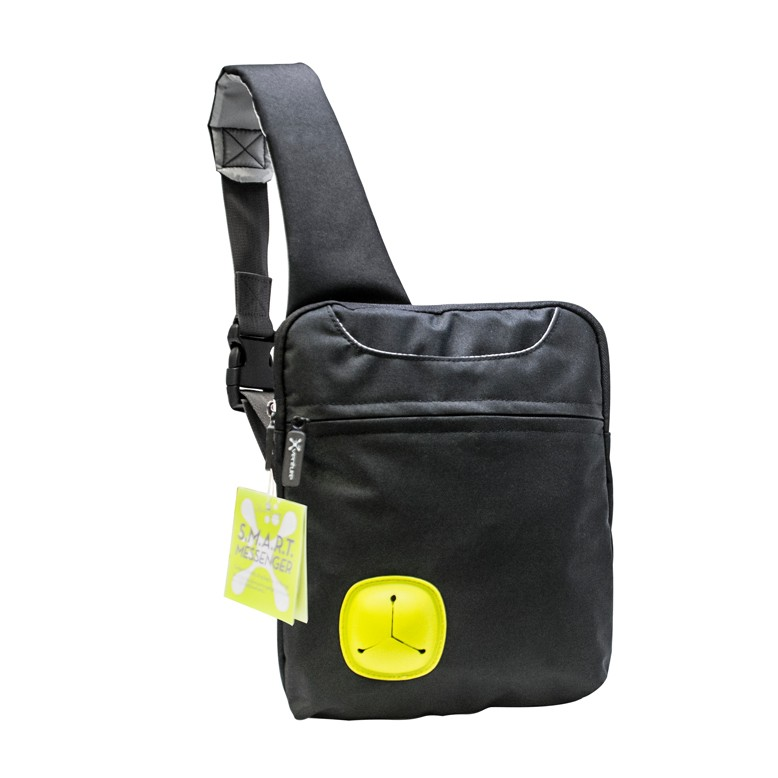 Bracketron’s SmartCord Sling Bag: A Portable Attention Hog | "DESTROY ALL FANBOYS!" The first day I used the bag, some guy on the subway tapped me on the shoulder to ask where I got it. I had the bag’s tag in my pocket, so got the website info onto his phone and hopped off a stop later. Later that same day, a couple riding up in an elevator with me was whispering to each other about the yellow cord storage bubble trying to figure out what it was before the guy asked me outright. Yep, that tag came out again. A few more days of random questions and compliments and I was starting to think I should be collecting a commission of any sales made from the NYC area. That bag tag in my pocket was certainly getting some wear from having to yank it out so much. The most amusing interaction was coming back from an appointment and having a woman with a toddler sit next to me only to have the kid start pushing that yellow holder like it was some sort of panic button. His mom looked over and after shifting her kid over (and yes, he tried to crawl back around to jam on the bag some more), she apologized and noted her son had some sort of crib toy at home with big colored buttons on it. It seems those buttons made noise and he was trying to get the bag to do the same. As he was getting a bit cranky, I told her about the bag and took out my earbuds so the kid could press away before he got to the screechy stage. The funniest part of this exchange was at some point the mother started making a *ding! * sound every time the kid pressed the holder. I noted that it was a good thing that crib toy wasn’t one with animal sounds and she got a good laugh at that, which made her kid crack up as well. Anyway, The SmartCord Sling Bag is indeed pretty great at what it does with only two minor caveats. One is that ear bud holder is perfect for generic to expensive ear buds, but some of the more complex ear buds with earpiece attachments may be a wee bit too large to fit the holder. The other thing is the bag could use a mesh water bottle holder next to the ear bud holder. While you can fit a bottle inside the bag, it looks best with flatter items inside. Well, perhaps that will be in the next model. This one’s a winner and a great little bag to have handy if you want to travel light and not lug around needless stuff as a habit. This entry was posted in 2015, Commentary, DAF, Holiday Gift Guide 2015, Humor, Updates and tagged Bracketron, Gear, Reviews, SmartCord Sling Bag, Stuff, Tech by geelw. Bookmark the permalink.